2 Bedroom Flat For Sale in Braintree for Guide Price £200,000. 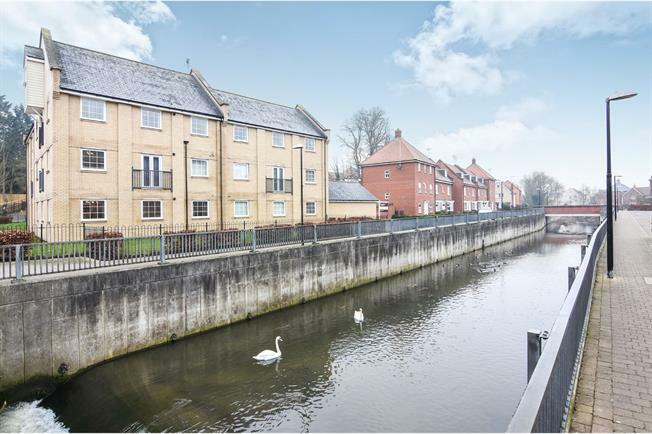 This impressive two bedroom penthouse apartment is set on the banks of the river Blackwater, and is the former show home for the development. Both bedrooms are larger than average, the Master comes complete with luxury En-Suite facilities. The open plan Kitchen/Reception room has windows and Juliette French Doors with a multitude of views down the river and the fields beyond. The vendors have upgraded many aspects of this stylish home, including; quartz tiles in the bathrooms and kitchen, the heating system and carpets. To the front of the property there is a private and secure garage with a driveway in front, and additional visitor parking in the nearby bays, which operate on a first come first served basis. . The large entrance hall offers access to all of the rooms except the En-Suite and has been newly carpeted. There is also a storage cupboard containing the heating system. The sitting room is open plan to the kitchen and separated by a central island. A number of windows and a set of French doors fill the room with light, and give fantastic panoramic views down the river Blackwater and the countryside beyond. The kitchen is fully fitted including integrated appliances such as; fridge freezer, dishwasher, washing machine, oven and hob. Further kitchen units are hidden beneath the central island that separates from the sitting room. This a super king-sized bedroom, with fitted wardrobes, views of the river and access to its own private En-Suite. The Master En-suite comes complete with corner shower enclosure, toilet and hand basin. The room has been fully tiled floor to ceiling. The second bedroom is larger than most Master Bedrooms, with more than enough space for a king-sized bed and all bedroom furniture, there are also views of the river from here. A three piece bathroom suite comprising; panel enclosed bath with shower over, low level WC and hand basin. The quartz tiles showcase the stylish nature of this enviable apartment. To the front of the property there is a private and secure garage with a driveway in front, and additional visitor parking in the nearby bays, which operate on a first come first served basis. Outside, the communal areas are maintained by the management company, including the riverside seating, walkways and planted borders.